Masai Mara in Kenya is one of the best slices of wildlife tourism in the world. With the improving tourism industry, the destination has much more to offer. Masai Mara Reserve - best known as the departure and arrival point for the annual migration (Great Migration) of millions of wildebeest and antelopes - is the most popular game park in Kenya. It stretches over 200 sq miles of vast grassy plains lying to the southwest of this spectacular East African country. Several safari operators arrange specialised tours, treks or hikes in this area. Masai Mara lies about 270 kms from Nairobi and takes about six hours by road. Tourists who desire to fly straight into the Masai Mara’s lodges via safari strips can use the Wilson Airport in Nairobi –the busiest domestic airport in Kenya. There are scheduled flights, twice daily from Wilson Airport Nairobi, which take about 40 - 45 minutes. Masai Mara can be accessed by road from Narok, a three hour drive from Nairobi. There are regular buses and matatus to Narok from Nairobi and other destinations. Accessing the Mara area is difficult without private transport. Most visitors come to Masai Mara as part of a safari package from Nairobi or in a hired car. There are a number of lodges and tented camps for tourists inside the reserve's borders. Lodges and camps inside the reserve include Mara Serena, Governor's camp; Siana Springs tented camp, Mara Simba, Keekorok, and Sarova Mara. Outside the reserve borders are Mara Sopa, Elephant Pepper, Royal Mara Safari Lodge and Sekenani camps. Mara Serena Airport and Keekorok Airport are located in Masai Mara. The BBC Television show Big Cat Diary is filmed in the Masai Mara. 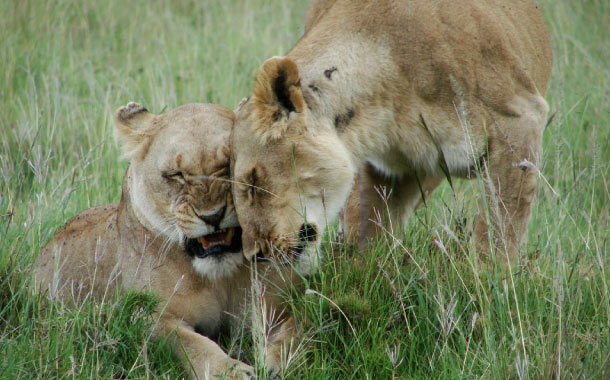 Masai Mara is perhaps most famous for its lions. All other members of the "Big Five" (lion, leopard, rhino, elephant and buffalo) are found here. Hippopotami are found in large groups in Masai Mara and Talek Rivers. Cheetahs are also to be found, although their numbers are also threatened, chiefly due to tourist disruption of their day-time hunting. The Great Migration is one of the most impressive natural events worldwide, involving a large number of herbivores: some 1, 300, 000 wildebeest, 3, 60, 000 Thomson's gazelle, and 1, 91, 000 zebra. These numerous migrants are followed along their annual, circular route by a block of hungry predators, most notably lions and hyena. hould bear in mind that even though the migration is one of Africa's most remarkable displays, Masai Mara is one of Africa's best wildlife destinations year round. Even if your visit falls outside the peak migration times, it does not mean you have lost out on what Mara is renowned for: an incredibly large wildlife population and diversity that ranges from lions and leopards to grazing Masai cattle. The Masai Mara Reserve is about a third of the size of the Serengeti National Park, which also makes it a more manageable area for game viewing. The best thing to experience in Masai Mara is balloon safari. For the best overview of the entire Mara reserve there is nothing like a hot air balloon safari from Little Governor’s Camp, lifting off at sunrise to float up and away across the Mara triangle, heading towards the Serengeri. The charges are about USD 350 – 500 per person (depending on the season) and the balloon can accommodate about 16 people at a time. There are other types of safaris offered like horseback safaris, walking safaris, migration safaris, bush and beach safaris, romantic safaris, luxury safaris, overland safaris and family safaris. Apart from experiencing the thrilling safari, the tourist can enjoy bubble bath in the bush. A Kenya safari would not be complete without a few days on one of Kenya's beaches. You could have the best of both worlds by combining your Masai Mara safari adventure with a few days of lazing on a white beach in Mombasa or Zanzibar. The range of options is almost limitless.